I was surprised but I shouldn’t have been. This weekend marked the first anniversary of the death of a 4-day-old kitten named Peter. 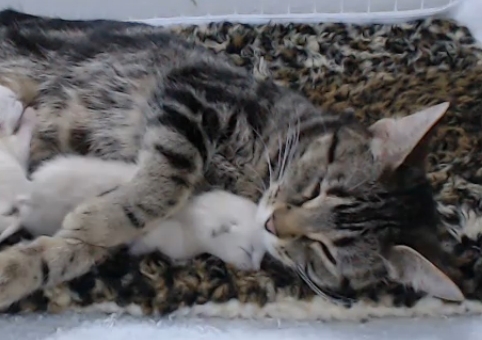 After witnessing his passing with a thousand other kitten cam viewers on The Critter Room Kitten Cam, I wrote about this tiny creature’s impact on a community (click here). Before discovering the Critter Room community I would have done the same. Now I am one of those “crazies” because The Critter Room community demonstrates again and again that every creature matters, animal and human. Adoption day is a big deal for every foster kitten and mama cat – the day that they graduate from being a rescue to being a permanent member of a loving family. All of the Critter Room fosters – kittens and mama cats – have been adopted. And to one very special kitten cam viewer, it just didn’t seem right that Peter would be forever a rescue, that he would not graduate with his brothers and his mama. And so it was that on adoption day not only did we learn that an anonymous kitten cam viewer had kindly paid Janine’s adoption fee, but we learned also that another anonymous viewer had adopted Peter, and would be receiving his tags. But that wasn’t enough. Peter needed to be reunited with his brothers and his mama, to be with them forever. And so care for his tags has now been entrusted to us, bringing him in spirit into our household and family, alongside Egon, Ray, and Janine. It brings us an extended family too, since this doesn’t change who adopted Peter, and who will always be his family. And of course, his memory is entrusted to all of us who knew him, however fleetingly. Click here for the full story. The Critter Room community is but one example of kindness and generosity poured out for cats and their owners. The first live cam that I followed was known as Seven Kittens. In that litter, a little runt with no hair who resembled Yoda captured our hearts. “Runty” turned into the magnificent Loki. Recently we learned that Loki, at only two, has developed a heart condition that will likely shorten his life. The enormous cost of his emergency visit to the vet after suffering heart failure was immediately assumed by his Facebook page community, literally within days of the event. Loki’s owner, Nat, has experienced first hand the caring of a community. I write about many things on this blog, all with this in mind: we are surrounded in our world with tactile reminders of love and grace. When we choose to belong to something bigger than ourselves that is life-giving, great things will happen. With all the ugliness of the world splashed all over our TV screens and throughout the internet, it is helpful, and necessary, to remember that good does exists all around us. Good exists in quiet pockets, populated by quiet and gentle people who laugh, cry, mourn and celebrate together. Whether it be “in the flesh” through our families and friends, or in the virtual world through Facebook and other social media, good is still out there, alive and well and thriving. Oh yes, that was devastating. Waxing philosophical for a moment, I wanted to add that the unity that exists in the Kitten Cam community works because of its basis on something simple–love of kittens and of each other. This can be applied to all things if we can resist the urge to pick everything apart and parse every point until it causes division. Yes, it’s important to learn and to understand, but some things frankly are beyond understanding and that’s when the leap of faith is needed to just jump on board or let it pass you by.